Teratic Tome is a retro-styled monster manual compatible with OSRIC and other old-school fantasy role-playing games. The cover and interior have been designed to capture the look and feel of some of the classic AD&D hardcover books of the early to mid-80s – the fonts, organization, and colors are all there, and a dead tree copy of this tome would fit right in next to the original orange-spined core books. The monsters within are truly monstrous, not just big and hairy, and could easily cover a shift to let one of Clive Barker’s Cenobites have a day off. There seems to be a strong theme of creatures that seek out specific victims – the Acronical, for example, is an insectile beast created by ancient priests to find and destroy those who have been unfaithful to their spouses, as well as any who have aided and abetted such activity. The Epexiant is a tentacled serpent who seeks out those who are so wracked with grief that they do not wish to carry on with their lives. (What it does when it finds one, I won’t go into.) And these are not even entries from the demon or devil sections! These are not monsters for a cheerful, fairy-taleish dungeon crawl. The dragons feature a list of horrific events that occur to herald their approach – unnatural weather, animal slaughter, and much worse. The halflings keep hell hounds as pets, and torture their captives for entertainment. If you’ve been looking for a bestiary to flesh out a Lovecraftian mythos styled fantasy campaign, I think you need look no further. The artwork is superb, and other than a few typos and a section where some paragraphs were repeated, the layout and content is excellent. It’s difficult to read most of the entries without getting ideas about how to work them into a game, even as you’re shuddering at the thought. 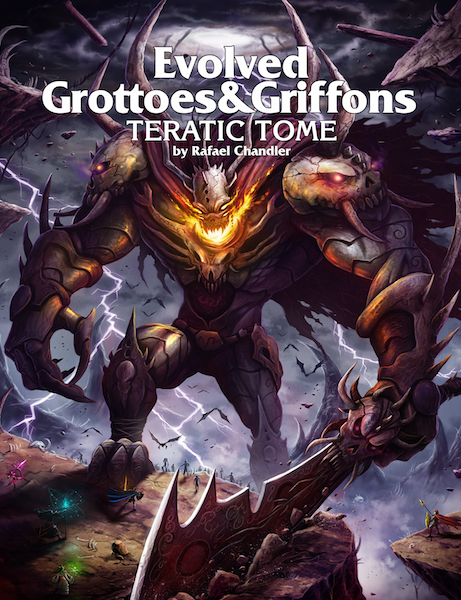 And that’s really where Teratic Tome shines – the attention to the details and motivations of the creatures really brings them off of the page. As a side note – there’s an interesting twist on the way treasure is handled that would be worth using in most of your OSR games, even if you don’t get a lot of use out of the monsters. Because I review a lot of RPG products with young people in mind, I feel obligated to say that these are NOT monsters to put into a campaign that you’re going to run for your kids. Please don’t. Save these for the grownups. And only the grownups with strong stomachs. Please. Thanks so much for the review! Incidentally, I had a few people point out that they wanted the cover artwork embedded in the PDF, so I’ve added that — if you re-download the file, the first page will be the full-color cover artwork. Again — thanks for the kind words!